Edwise International helps you to take admission in best Colleges or University in Abroad for Studies. Our consultants will help/guide you to apply for admission to Study Abroad. Know Tips for International students to study abroad with the help of with the help of Edwise International Read our blog / Articles for latest updates and news and to know information about Benefits of Studying Abroad. Enquire now 18002003678 for more details and Information. Studying abroad can be one of the most self-satisfying experiences you will have in your entire life. It allows you to branch out and learn more about the country and the people around you. In addition to providing you with limitless opportunities, it inspires you to take each moment as it comes and make the most out of your time abroad. An international degree is an investment into your future and can change your life for the better. Our organization has a single-minded approach, to guide students to well renowned institutions and enable them to build a promising future for themselves. With our expertise and vast experience, we help identify the country most suitable to your requirements. Here are some reasons why studying abroad makes a difference. Studying abroad helps you master skills that are desirable in today's job market. It not only boosts your self-confidence, but is also a wonderful opportunity for you to learn more about yourself. You will leave a different person than when you first arrived. One of the most important life lessons you will learn when studying abroad is to never take things for granted, you become more outgoing and appreciative of your surroundings. Additionally, you also discover things about your own country from a different perspective. Living abroad inculcates valuable life lessons, ones that cannot be learned from a classroom alone. Staying away from family and friends is never easy. 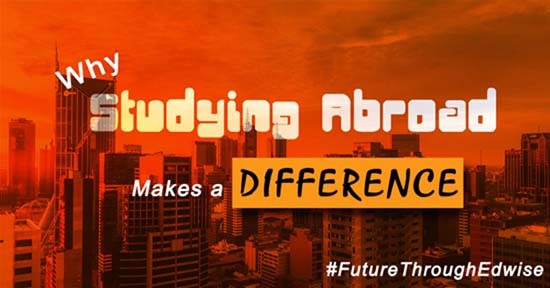 A semester abroad encourages you to take charge of your life and carry out your duly responsibilities. This experience will add meaning to your life and is the perfect opportunity for you to rediscover yourself. Studying abroad will provide you with an endless list of opportunities- embrace them. Exposing yourself to new experiences will help you adapt to situations, you will also find that interacting with people from diverse cultures makes you more open minded towards people with different lifestyles. One of the greatest advantages to studying abroad is meeting people that share similar interests as you. Networking expands your global network and introduces you to people from different walks of life, thereby increasing your chances of securing a job in the future. "Edwise has really helped me in choosing the right university which has enabled me to take a giant step towards a successful career .All the counselors at Edwise are well trained and well versed in providing information to students. Today owing to the efforts of Edwise many aspiring students have been shown the right direction. Thank you... Edwise." "It was awesome from the very first day. I was accompained by the inspiring attitude and helpful behaviour. They helped me with my application, documents and ever with scholarship and visa." "Edwise has really helped me with my applications to my preferred universities. Infact, I owe all the credit to my counsellor and Edwise ofcourse for the timely assistance regarding my offer from Le Cordon." "I have always seen EDWISE working hard with their work and everything. They never delayed my work when it was their responsibility to do that work. Things were done even without saying it to them. They kept a track of everything and kept me informed too!" "My experience with Edwise has been absolutely wonderful. You guys have made such a tiresome procedure so simple and well managed. I would particularly like to thank my Counselor who has sorted each and everything for me from my application to my visa well within time. Thank you so much for answering my calls 10 times a day also when needed. The entire process would have been a whole lot tedious without your help. Thanks a heap! :)"